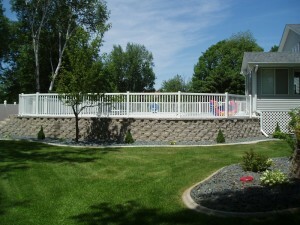 Arrow Fence is a local Minnesota Fence Company that has installed many types of fencing. From ornamental to maintenance free vinyl, our process and quality has enhanced many residents’ everyday life. Many customers are searching for dog fences, garden fences, pool fencing…and the list goes on. Our Fence Installation Team works with each of our clients to design the perfect fence for the property and application. Not to mention, our installation is always a beautiful addition to any outdoor space. Dog Fence – Is your beloved dog sick of using the restroom on a leash? Then, a dog fence might be for you! 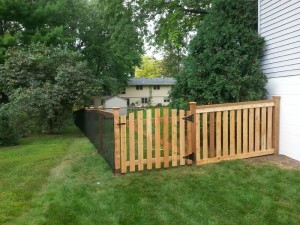 Our fence installation team has experience with installing all types of dog fences; some for privacy, some with a view. It all just depends on what you would like to do with your new addition. Garden Fence – Are you sick of animals making a meal out of your hard-earned garden? A garden fence might be for you then! We can customize any type of fence to fit, not only, your garden needs but your own personal style. Making your garden easier to manage and enjoy. Pool Fence – Pool fences are a smart addition. Keeping your family safe and preventing neighbors from gaining easy entrance. 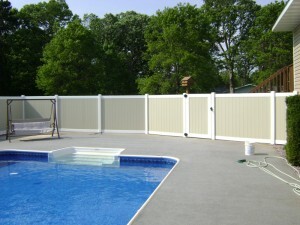 In addition to safety, pool fencing can also become a beautiful boundary for your outdoor oasis. Take a look at some of our work! Being in the business for over 30 years, we know our fence additions last, as has our company. Which is why we are happy to Guarantee a 5-year warranty on all of our completed fencing projects. We are there for you years after the installation is completed to ensure you are more than happy with our work and our products. Call our Fence Company at (763)755-0088 for a Free Estimate on installation and fence replacement today.